HP Networking 7502 Switch Chassis. 2 MPU (for management modules) slots + 2 I/O module slots + 2 power supply slots. The HP 7500 Switch Series is a versatile modular switch designed to meet the evolving needs of integrated services networks. It can be deployed at the enterprise LAN core, aggregation layer and wiring closet edge and offers 40GbE connectivity, cost-effective wire-speed 10GbE ports, high density PoE/PoE+, advanced functionality with service modules and BYOD-ready features with the wired-WLAN module. With HP Intelligent Resilient Fabric (IRF) technology, the HP 7500 Switch Series can be virtualized across four chassis with a single management interface--enabling flatter, more agile networks. • The HP 7500 Switch Series consists of modular switches designed to meet the evolving network demands of the enterprise LAN core, aggregation layer, and edge. This series offers 40GbE connectivity and cost-effective 10GbE ports for mission-critical applications and high-speed communications. 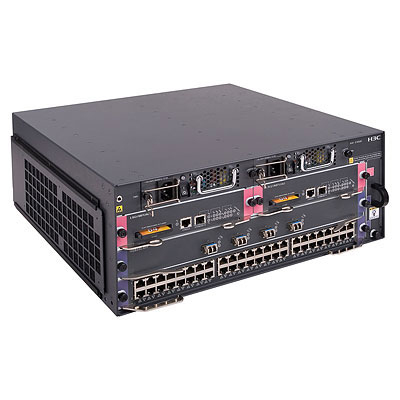 • The HP 7500 Switch Series supports a maximum of 1,152 Gb/s switching capacity with a 2.4 Tb/s backplane, delivering enhanced performance and future expansion capability. • The HP 7500 Switch Series includes a robust set of security and quality of services features to build a trusted network that meets your ever-changing corporate policies and compliances. • The HP 7500 Switch Series can be seamlessly managed with IMC which provides end-to-end network transparency with consistent network experience through comprehensive configuration, compliance and policy management.